Bring a NEW challenge to your team and some FUN into your preschool and recreational classes. 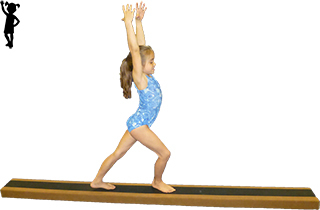 TEAM: The DGS Wobble Beam™ will bring a new understanding of balance and core strength to your team program. They will develop a new appreciation for the stable and steady competition beam. PRESCHOOL AND RECREATIONAL CLASSES: The DGS Wobble Beam™ is a fun and challenging tool to gaining skills of balance. Get your sea legs on and try walking across this wobbly wonder. Good luck! DETAILS: 8 feet long x 7 inches wide. The working surface of this beam is approximately 4 inches from the ground. Standard: Suede beam will wobble more on a hard surface floor and less on a thick carpet or floor exercise.